There's nothing new about this dish. 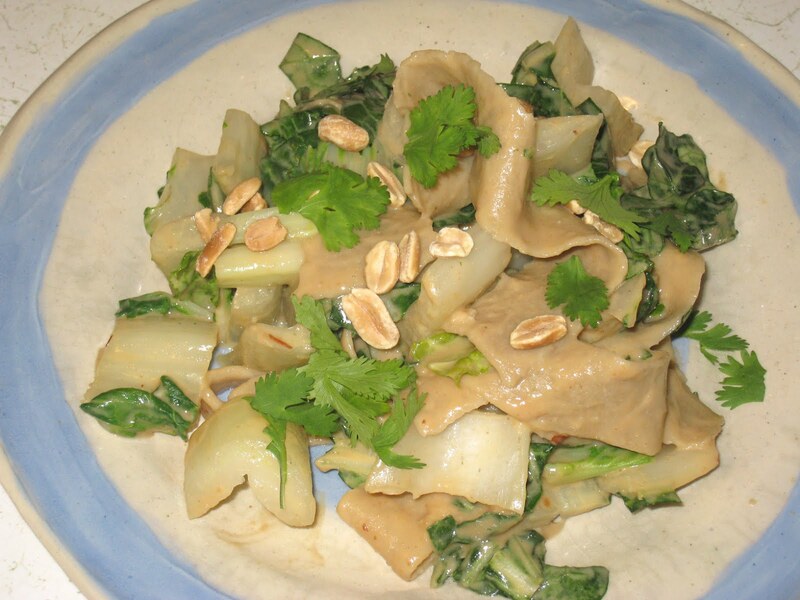 I've been making peanut sauce for years now, bok choy has been a regular in my kitchen, and I've been making my own pasta since I took my first Master Class at FENI 2010. What makes this so exciting to me is that it was my first attempt to make whole wheat pasta (as opposed to the white whole wheat pasta which, while better than all-purpose flour, is still not quite as healthy as regular red whole wheat). I used whole wheat pastry flour, which has a different texture from the white whole wheat so I wasn't sure that it would work. But I am showing some friends how to make pasta next week and one of them prefers whole wheat so it was a good opportunity to test it. I followed my usual recipe of 1-1/2 cups flour, 2 eggs and 1/4 of a teaspoon salt. I started with 2 cups, made a well, cracked the eggs into it and added the salt. I beat the eggs and salt together, slowly incorporating the flour until it made enough of a dough to put down the fork and start working with my hands. It came together nicely, although it was a little more stiff and required more elbow grease to bring the dough together and to knead it. It had less spring than the all-purpose version, enough that I was a little worried that it would not hold together during the rolling, but it turned out to be easier to roll out than the all-purpose dough. The next test was to cook the pasta. I had the thought that the noodles might dissolve in the hot water, but they held together perfectly. I cooked them for about 4 minutes, which was enough to cook them through without turning them to mush. It had the same taste and texture of dried whole wheat pasta compared to regular. While more dense than regular, there was less tooth to it, but the deliciously nutty taste more than made up for that. I only cooked half of the pasta the night that I made it. I wanted to make sure it would hold up in the refrigerator for a few days before cooking so I held off and cooked the second half two days later. The result is what you see here. The result was just as fresh and delicious as the first batch had been. The entire dish came together quickly. I made the peanut sauce while bringing a large pot of water to a boil. I salted the boiling water and added the chopped bok choy stems and cooked them for 2 minutes. (I put the chopped leafy green part at the bottom of a large bowl without cooking it at all - thinking it would wilt enough with the heat from the cooked stems and the pasta.) I removed them from the water and put them on top of the stems, then I added the pasta to the water and cooked it for 4 minutes. I added that to the bowl, then the peanut sauce, and stirred it all together. I served it garnished with fresh cilantro and peanuts. While there is nothing like the taste and texture of freshly made pasta, regular or whole what, this dish would work just as well with dried.